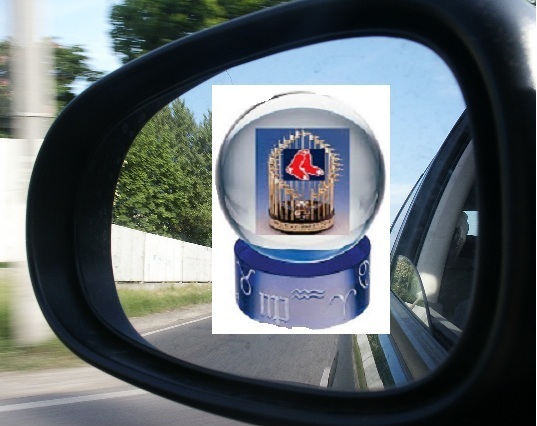 As we start a new year, hopefully one with better results for our Red Sox, time to reflect on the first year of this blog, and look at the best and worst predictions that I made. After reading through these, I welcome you to share your opinions in the comments section. Colorado beating Oakland in the World Series. I think I at least get a break on this one, as it was made in January before the end of all the off-season moves and I was trying to be original. Every other prognosticator had picked Philadelphia and the Red Sox, and neither team played in the Fall Classic, so in that sense my prediction was no worse than everybody else's. I made some other poor choices on this initial power ranking too, including having Cleveland as the worst team in the majors. Preseason Predictions A month later I had some more complete (but not better) predictions. Twins winning the AL Central? Justin Morneau as a leading MVP candidate?? (he hit .227). Admittedly, I may have had a little Canadian bias in that selection. With everyone picking Halladay or Cliff Lee for the Cy Young, I took their teammate Roy Oswalt instead. His 9-10 record for a 102 win team just didn't quite get it done. Dice-K turnaround: After Matsuzaka pitched shutout ball for 7 innings against the Jays, while only allowing one hit and one walk, I thought he had righted himself. When he threw 8 innings of 1 hit ball in his next start I was convinced, he'd be the strong #3 we needed. He wasn't. 'Nuf Ced. Diamondbacks not for real: Heading into June, Arizona was clinging to a slight lead over the Giants when I said "It won't last, but they could end up a solid 3rd place". In August I updated my comment to "Have kept up with the Giants. Will they stick around? I would guess not, but then again, I didn't think they'd stick around this long." It lasted, and they stuck around. They missed the NLCS by just an extra inning loss in Game 5 of the NLDS. Cardinals won't go far in playoffs: This one was from my twitter account. Right after the Braves lost in extra innings, giving the Cardinals the wildcard I tweeted this "Congratulations to the Cardinals on earning the right to lose 3 straight playoff games to the Phillies." I took a bit of abuse on the twitterverse from St. Louis fans for that, but probably not as much as I deserved. Preseason power rankings: Despite misfiring on the World Series prediction referenced above, I had a few good selections. I picked Milwaukee winning their division, citing "a real good rotation, in a not so real good division". I had Tampa at #8 and favoured to win the wildcard saying "They may not win 90, but they’ll be close". They finished with 91 after everybody else had written them off. I had the Reds all the way down at #14, controversially (to many Reds fans who contacted me) saying " I don’t see them duplicating last year’s success". They didn't, ending below .500 in a weak division. Of course I made many other predictions in this poll which came true, but they were, well, predictable, and I can't take too much credit for venturing the Phillies to be good, or the Astros to be bad or saying the Orioles might even win 70 games (69). Preseason Predictions: I had A-Gon as AL MVP and mentioned Miggy Cabrera, while picking Fielder in NL; Ackley as RoY with an honorable mention to Desmond Jennings as well as Freddie Freeman in the NL. These were all good but fairly predictable choices. Where I think I excelled, was selecting Milwaukee to win the Central and St. Louis as the wildcard narrowly beating out Atlanta and others. I figured the Angels would regret trading Mike Napoli (see #22 in link). Specifically I wondered aloud "What where they thinking?". Napoli ended up with a 171 OPS+ for the Pennant winning Rangers while his replacement Jeff Mathis ended up hitting .174 with a OPS+ of 37. Again, though, I think everyone except Mike Scioscia could have seen this coming. Too early to panic: On April 13th, we were 2-9 and things were not looking good. I remarked that "A visit by a team whose fans are still watching hockey is exactly what we need to turn our luck around", and we beat the Jays 3 straight times in convincing fashion, to start the 82-42 run we had until September. Tampa contending: On June 1st, the Rays were just above .500 when I wrote "they are determined to make it a 3 way race in the East despite all the off-season departures". I really wish I had been more wrong about this one. I made some more predictions that turned out true in August and September, but that late in the season nothing was a surprise. Not giving myself much credit for saying Detroit will win their division, and opponents will be scared to face Verlander in ALCS. We will have a pennant race! Heading into September many in the media were lamenting the lack of suspense in the division and wildcard races, and talked about how adding an extra wildcard team would have added to the excitement of the end of the season. Well, I warned that "all playoff spots look secure, but there's a reason they play the games" and referenced the 64 Phillies, 95 Angels and '07 Mets. Again, wish I was wrong as I'm not really keen on adding the 2011 Red Sox to this unenviable list. So, tell me, loyal readers: Which do you think were my best and worst predictions of the year? And while at it, feel free to comment on which posts you have enjoyed the most and what you'd like to see more of in 2012. Happy New Year and let's hope 2012 brings us Red Sox fans better things than 2011 did.